Connecting to a wifi network has been made much simpler in most cases by including a version of Roy Marples’ excellent dhcpcd and dhcpcd-ui packages. If you look towards the right-hand end of the menu bar, there is now a network icon. This shows the current state of your network connection – if a wifi connection is in use, it shows the signal strength; if not, it shows the connection state of your Ethernet connection. While connections are being set up, the icon flashes to indicate that a connection is being established. 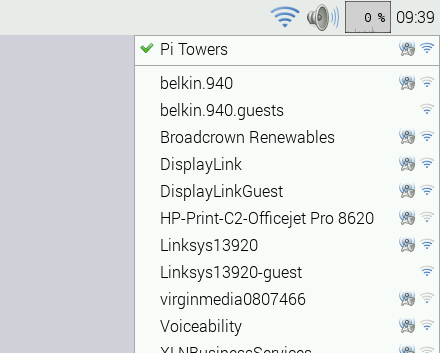 To connect to a wifi network (assuming you have a USB wifi dongle connected to your Pi), left-click on the network icon and you should see a list of all visible wireless networks. Select the one you want, and if it is secured, you will be prompted for the network password. Enter the password, press OK and wait a few seconds for the wifi icon to stop flashing; if you then left-click the icon again, the selected network should be shown at the top of the list with a tick next to it, and you are then good to go. If you right-click the network icon and choose the Wifi Networks (dhcpcdui) Settings option from the pop-up menu, you can manually enter static IP addresses – choose the SSID option from the Configure drop-down, select your network and enter the IP addresses you want. From the same dialog, you can manually enter an IP address for your Ethernet connection by selecting the Interface option from the drop-down and choosing eth0 as the interface. Once you’ve clicked Apply, you may need to reboot your Pi for the new settings to take effect. in a terminal window to open it. If you right-click the volume icon, a pop-up menu appears to allow you to select which audio output is used – on a standard Pi, you have the choice of HDMI or Analog. If you have installed a USB audio interface, or an external soundcard, these will also appear as options in this menu. 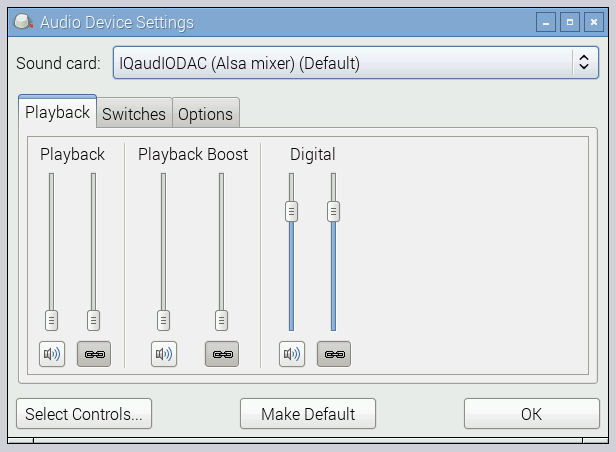 To allow more detailed control of any external audio devices, we’ve included a custom version of xfce4-mixer, the mixer dialog from the XFCE desktop environment – you can access this either under Device Settings from the volume right-click menu (the option only appears if there is an external audio device connected) or from the Preferences section of the main menu, where it is listed as Audio Device Settings. From this dialog, select the device you want to control from the drop-down at the top, and then press the Select Controls button to choose which of the controls the device offers that you want to display. Pressing the Make Default button on this window has the same effect as choosing an output source in the volume right-click menu. There is a new custom Appearance Settings dialog, available from the Preferences section of the main menu, which works with a new custom theme for Openbox and GTK called PiX. This allows you to set how your desktop looks (colour, background picture), how the menu bar looks (including an easy option to move it to the top or bottom of the screen) and how window title bars look. Various other applications have been updated – the Epiphany browser has had speed and compatibility improvements; the Minecraft Python API is now compatible with Python 3, and there is a new version of Sonic Pi. Updating will overwrite your desktop configuration files (found in /home/pi/.config). Just in case you had customised something in there for your own use, the original files are backed up as part of the upgrade process, and can be found in /home/pi/oldconffiles. As ever, user interface design isn’t an exact science – my hope is that the changes make your Pi nicer to use, but feedback (good or bad) is always welcome, so do post a comment and let me know your thoughts! Can you set the time format? Last time I looked there was one of the config files that needed editing to change that. Yes, that can be set in the Clock Settings options – right-click the clock on the menu bar and choose “Digital Clock Settings”. Change the “Clock Format” string to “%l:%M %P” (making sure you set the case of each letter correctly – lower case l, upper case M and P). The man page for strftime gives full details of formatting options. This is far from user-friendly, which is why I removed it last time, but enough people wanted it back that I’ve reinstated it. At some point I may change the settings to allow a selection of useful options rather than the free-form editor which requires an understanding of obscure C syntax strings! Good oh! That was a problem with your December Desktop. Mine was grey out. How do I fix it? Ok! I got it working. But how do I write 12 hrs am/pm format? Love the ease of use for Audio and Wifi set up. Time to break out Python 3 with Minecraft and learn about music. Q: If I use the new GUI to set up wifi and then reboot but do not start X, are the setting still enabled? This is what I do currently so that tin the future I can just SSH in over the network. Yes, the network settings are independent of X and should persist if you subsequently boot to the command line. Pi here is a bog-old B, 256. Network setup has given me grief! The new system does NOT ask for a security Key, I had to put that in with the old system (wpa_gui), and then the dhcp did NOT fill in the blanks for DNS from the Router/AP – I had to research that from the ISP’s site to refresh my memory and enter it manually. (This may be the fault of the ISP-supplied unit; it’s a “technicolor”, Euro design, Chinese make). Mouse hover gives the status, but no signal strength figures – the nearest given indication is the 3 or 4 levels indicated by the icon. I’m now struggling with restoring the hard-disk setup I had before, but it continues to be an adventure :). p.s. another fly in the ointment (omologato! ): the Shutdown dialog could do well to respond to clicking the label as well as the radio-button. It’s a nice detail that you can change the volume with the mouse scroll wheel over the speaker icon. Keep on with the improvements! -it’s been sorely needed for a while! About desktop environnement, what’s the status of the wayland/weston implementation in the current DE? Maynard was promising, but there hasn’t been any changes on GitHub for about a year now, has it been abandoned? or have you and Collabora switched to a private Git? I believe wayland and maynard is temporarily shelved. A lot of this stuff will fall into place nicer when Anholt’s driver is ready, but it’s more of a long term thing. Ok, I thought it was somehow linked to the development of the VC4 open source driver. Is it correct that a lot of appearance settings have been removed? I can’t find the option to change the icons anymore sadly. If this is the case I’d prefer the old GUI personally. Is there a way to go back? The option to change the icon set is still included; I don’t remove software – I just hide it from the menu. If you want to access the old appearance configuration dialogs, you just need to launch them from a terminal window. The one which is used to set icon sets is called “lxappearance”; the one for window appearance is called “obconf”. Just type “lxappearance” at a terminal prompt, and you can choose the icon set you want – this won’t break anything in the new UI. Hm… I’ve done the distro upgrade and the wifi thingy, but now dhcpcd fails to start when booting the device. When I’m in the desktop environment and I click the wifi logo on the taskbar nothing much happens, when I rightclick and go to the settings I (sometimes) get an error telling me that dhcpcd isn’t running but usually it just does nothing. dchpcd fails to start on launch wether I got a usb wifi adapter plugged in or not. What happens if you try to start dhcpcd yourself from the command line, either on its own or with sudo? It might be that your wifi dongle has issues that mean it isn’t compatible for some reason – I had to hack in a workaround for the Edimax dongle because for some reason the driver doesn’t set the “wireless” flag in the data read back by dhcpcd. Which dongle are you using? It’s a cheap 5 euro 150 mbit wifi adapter that you can get on sossolutions[dot]nl. I don’t think it has a brand, but I do think it’s probably a popular adapter around here. After booting and before I entered startx, I entered sudo dhcpcd and that worked. At shutdown it did tell me again that dhcpcd failed to start, but it was a bit too quick to read properly. But gui-wise everything worked as it should. Thanks again! In my case also, when I click on the dhcpcd icon, nothing happens. Also, when I right-click and select “WiFi Networks (dhcpcdui) Settings”, nothing happens. I can still run up wpa_gui by typing it on the command line, but when I type “dhcpcd” on the command line, I get “bash: dhcpcd: command not found”. Now when I press the volume up/down/mute on my keyboard will nothing happen like before? Are there more WIFI chipset supported in this release? That’s not something that’s going to happen in the near future. Your best bet is first getting those chipsets supported upstream. Is it possible to make lxappearance and obconf visible in the menu again? Also, why on earth was Roboto Thin chosen as the default font? On my Pi2, I found it to be a poor choice—not particularly readable even on a full HD monitor. Droid Sans is FAR better. Which package do the latest changes affect? That way, I know NOT to upgrade it. There’s no one size fits all solution to UI, which is why you have choice. You can remove some .desktop files from /usr/share/raspi-ui-overrides/applications/ to restore menu entry items and you can use pipanel to change the font. I like the new wifi GUI. I have noticed that wpa_supplicant has issues with some cisco enterprise WIFI systems and authentication. Is there any way to change the default authentication system for WIFI? It would be cool if we could use the same GUI for both. You say that wpa-gui can still be used with the new changes. Does that also apply to wicd? I rather prefer the wicd interface, but wpa-gui and wicd don’t play well together. I note that, on the download page, Raspbian shows a date of 5/5, but the offline version of NOOBS is still 1.4.0 with a 2/16 date. I have no doubt that NOONS itself hasn’t changed (the “thin” version of NOOBS shows as 1.4, which makes sense), but does that mean that the current NOOBS-with-Raspbian doesn’t include the newest Raspbian yet? Yup, so far it’s just the image. The NOOBS guy is a bit busy and I am a bit cautious about doing it myself. Everything working nicely. Had to remove old /etc/network/interfaces file and purge followed by re installing the new network mod. The new wifi setting is working better with home router. Liked the HDMI analogue audio settings. Changed back to old icon set. That’s about it. Q: Do I supposed to have IQAudioDAC (your screenshot) as default ALSA mixture. All I am getting is bcm2835 ALSA as default. No, the IQAudio mixer was just shown as an example of an external soundcard, as it was the one I had lying on my desk! If you’ve got no external audio devices plugged into your Pi, you should only see the BCM2835 ALSA device. Cool! Thanks for the changes. Keep up the good work. Thank you for providing a fun OS to use on the Raspberry Pi 2. Amateur Radio applications for the Raspberry Pi are growing which is also cool. Excellent stuff! One question though; I’ve updated and the “pi” user has the new widgets, but another user I’ve created does not. I did try renaming ~/.config in the hopes it would re-create it with the new widget… but that doesn’t quite work (renders it unusable!) so I’ve put it back. As long as the session you’re starting is the lxde-pi one, the relevant files should be copied to your .config at the start of the session. How are you logging in and starting X? I’m logging in at the console as me (“pryan” as opposed to “pi”), and then typing startx. It might be a good idea to ask this on the forum. I had the same issue. It appears the upgrade process just modifies /root and /home/pi configurations. I manually saved a copy of my .config on the non-standard users and then copied the contents of /home/pi/.confi to my .config. Ok, It was using a railroad spike where I probably only needed a couple of carpet tacks but since I was on a fairly new install anyway there wasn’t much to lose. Could you also make sure that when installing OpenVPN and/or PPTP-linux it will work in all accounts not just in root? I’ve been banging my head over this for the last 2 months and haven’t found a solution yet. Thanks for the updates they look good. However I now have a problem. I have an entry in fstab to mount a network drive which always used to work. However since the update it no longer mounts at startup. If I enter a terminal and enter sudo mount -a it appears, but it used to appear automatically. I have tried via wifi and ethernet and still the same problem. To eliminate any other problems I made a fresh install from the new Raspian image but still the same problem. If I go back to my old image it all works again. I’ll have a look at that and try to replicate it. My guess is that the timing of the establishment of network connections during boot has changed, and as a result, fstab is trying to mount a drive before the network connection is actually up – dhcpcd may well happen later in boot than network setup did on previous builds. It may not be possible to get every individual network setup working with the new GUI, which is why we had the network mods as a separate package from the rest of the system, but I’ll see what I can dig out about this. Yes, it’s a timing issue; I’ve replicated it here (and there seem to be reports of similar online on other non-Pi systems). There’s an easy (albeit slightly kludgey) fix which I’ve tested and seems to work – just add the line “mount -a” to the end of /etc/rc.local, before the line “exit 0”. That just forces network shares to be mounted at the end of the boot sequence. ObDisclaimer – I am not a Linux networking expert, so this might be the wrong thing to do, but it seems to work, and doesn’t seem to do any harm – give it a try. Thanks. It is now working. Maybe this fix should be put in a sticky or something in the main forum as I’m sure others will have this problem? Thanks again for looking into it so quickly, and nice work with the new features. I have this problem on my desktop computer (Ubuntu 14.04(.2?) LTS), it’s not just Raspberry Pi related. I think I added the “user” and “noauto” mount options – this means that the drive isn’t actually mounted until you try to use it for the first time. The Wi-Fi changes were much needed, thanks! Looking forward to setting it up. Why does it not download for me when I do the update, upgrade, dist-upgrade apt-get calls? It doesn’t seem to see anything. Not sure what you mean. But the update downloads about 7 megs, but upgrade and dist-upgrade yields 0 data down. The article states “you may not want the new changes, as they will overwrite your network configuration”. Which files are changed – I assume /etc/network/interfaces and /etc/wpa_supplicant/wpa_supplicant.conf. Are these backed up? My observation: The update replaces old /etc/network/interfaces with a new one. This is needed. So if you don’t allow it, dhcpd service does not start. The update keep the settings in wpa_supplicant. Yes, exactly – the change is to /etc/network/interfaces, and I think we back it up to a file in the same directory with an extension like .backup or similar. As far as I can remember, we don’t change wpa_supplicant.conf. I ran `apt-get install raspberrypi-net-mods` and this warned of changes to `/etc/network/interfaces` which I reviewed but did not install (because I failed to press the right key). [FAIL] Not running dhcpcd client because /etc/network/interfaces defines some services that use a DHCP client. Where can I find the proposed `/etc/network/interfaces` changes (or get rid of the `raspberrypi-net-mods` changes `apt-get remove raspberrypi-net-mods` does not seem to work. Awesome! Finally we can control the volume without using the command line! Actually, it was possible already before to add the panel plugin ‘Volume Control (ALSA)’. Is there a way to change clock color? If not then that would also make a nice addition to this new changes. The latest Rasbian release dated 05-05-15 is a disaster. It does not work with the original Model B. It may work with the Pi 2 but not the model B. I have wasted hours, gone through three dd image copies of the latest OS to SD cards, to find the cause. The OS keeps losing the network card, the keyboard and anything else that is USB, and then chokes requesting a reboot to do it all over again. The same bugs are in the dist-upgrade mentioned above. After some experimenting, the model B device itself could be part of my problem here. It is one of originals. I can’t get it to install Noobs, it seizes up. Tried it twice, got 5% and 13%, then no more. If someone could point me to an archive from Sept 2014 and that OS version for download, I can download and see what the difference is. The current archive doesn’t work. The Pi was working fine until I did the dist-upgrade on one SD card. When it failed, I then downloaded the latest archive and it gave me errors, and then tried the noobs to get the pi running again but it seems to done after two attempts. Is there a page somewhere for an old version of the OS ? I’ve not tried the new image on an original Pi B; it’s been tested on a Pi B+ and a Pi2. There is no reason why it should behave differently on a B from a B+; the processor is identical and the software image should be the same. I’ll give this a try on Monday, but I suspect it is an issue with your B rather than a problem with the image itself. After trying two more sd cards, it is the Pi, and I have tossed it. Thanks for the reply ! I’ve just tried it myself on my old Pi Model B, and it worked fine; no visible difference from the B+ I used for testing, so it does indeed look as if you’ve got faulty hardware. For the staff in quality control… the sticker number on the bottom says FNXM121119969 and logo date is 2011.12, with it plainly stamped made in china… one of the originals. As mentioned it has been working fine. Your first clean-up eliminated ability to add Categories. Can we PLEEZ have a Menu Editor of some sort to put sub-menus and items into the Menu? There are several Ham Radio programs I would dearly love to have in their own sub-menu, and other relevant ones I cannot get into existing places either: how do the .desktop files’ ‘Categories’ entries relate? Is there a HowTo somewhere? Which Ham Radio programs? Could you give a list? Other apps can be found in the repo via aptitude (there are quite a few!). Gparted seems to have plonked itself under ‘Preferences’. I’d venture it better placed under ‘System Tools’. That’s likely an artefact of the install script, no? To the people complaining about 500 Internal Server Error, that has nothing to do with the image or anything that has been done for the image. It’s just an unrelated server issue possibly because it’s getting a hammering. Try again later. Aptitude did the same ‘plonk’. Non-standard structure perhaps? Network icon OK on top right, but with greyed X box and hover pops up “not running”. apt-get installed dhcpcd, but could not find dhcpcd-ui to re-install. Are those two parts of another package? wpa_gui shows network running OK, and remote desktop works, so the dongle is still recognised OK by the system. I don’t use the audio (yet), so haven’t checked the control there. Ongoing thanks for the clean interface – keep up the good work! You didn’t need to install dhcpcd or do anything other than what’s in the blog post. You’ll need dhcpd5, but that’s a dependency of raspberrypi-net-mods and would’ve been installed if raspberrypi-net-mods installed correctly. I can confirm that the repo itself is fine, it’s just the server that seems to be having trouble. As far as the other stuff goes, a menu editor is already in the works. Also, dist-upgrade now reports complete, but I suspect some bits haven’t. About to rip the whole lot up and start again! apt-get installed raspberrypi-net-mods, now wpa_supplicant won’t start, so no network :( Also note sudo now fails to recognise hostname – what gives? Hey! I really like the update! But I have problems with my external (USB) sound card. It worked fine before the update, but if I try to play soundcloud through the epiphany browser for example, I don’t hear anything after the update. If I right click on the speaker icon on the top right the “Analog” output is selected by default. I then try to select the “USB Device 0x41e:0x30d3”, but it doesn’t let me do that. In the “Device Settings” I can select the USB card, but it still doesn’t play sounds. Strangely, if I do a simple soundtest (noise on the speakers) or aplay a sample .wav file that also works. Mhh… where is the problem? Which particular external sound card are you using? I may have to try and get one to test. There is a possible issue which I saw in testing, whereby the volume plugin has to guess what the primary volume control on a sound device is called, and there is no standard for this that I can find. It currently looks for controls called Master, Front, PCM, Digital or LineOut, but if your card’s master volume control has a different name, it will behave as you describe. Try opening the Audio Device Settings from the Preferences menu, select your USB device in the dropdown, and then hit the “Select Controls” button – it would be interesting to know which controls it lists to help me to diagnose this. … all of them can be activated. If I go to the alsamixer I can select the sound card and record from my microphone. But it doesn’t accept it as standard audio device it seems. Thank you for the information – it proves what I had suspected, which is that you have fallen foul of the lack of standard names for ALSA controls! I think what needs to happen is for the control labelled “Speaker” to be the one onto which the volume control maps, but “Speaker” isn’t one of the names that were used in the list of controls to look for. I’m afraid there’s not much I can do about this in the short term, not unless you feel brave enough to try and rebuild lxpanel from source… (On the other hand, if you do feel like trying that, reply here and I’ll point you in the right direction!) But I’ll look at making the list of selected controls customisable for the next release, which should fix your problem. We’re hoping to move to more frequent releases, so hopefully it won’t be more than a couple of months away. Apologies for the inconvenience, but this is one of those issues where the problems don’t show up here because we can’t test with every possible output device. Hey, no problem, thanks for the explanation. I don’t feel confident to rebuild lxpanel from source, so I guess I just have to be patient and wait for the next update. In the meantime is there any way I can force audio output through my external sound card so I can hear sounds coming from the browser and other applications? Epiphany web browser no longer leaks memory, but it crashed twice when I tested it with http://spelprogrammering.nu/r2/bubblande_form.html and http://spelprogrammering.nu/r2/ritprogram_2.html , but I can’t reproduce the crash reliably. Hi, any chance of adding a GUI panel that gives control of the proxy setting in the future. Seems a bit tricky, since Linux doesn’t have any one single way to configure the proxy for everything. Setting the HTTP_PROXY env var seems to work for most things, but maybe that doesn’t work well with a gui. Afer the Update, the xfce4-mixer just disappeard form the xfce4-panel and can’t be add again. That’s kind of sad, because I preferred xfce as my primary Desktop. I hadn’t realised anyone was using XFCE – if you are, you should really ignore these GUI updates, as they are only intended for LXDE, which is the default Raspbian desktop. I’d suggest you use apt-get purge to remove the modified xfce mixer and then redownload and install the plain vanilla version. Unfortunately, that doesn’t work. The package in our repo will get installed either way, which is why I thought it would be a good idea to fork it instead. Marc, if you look at ‘apt-cache policy xfce4-mixer’ and check the version in the raspbian.org repo, you should be able to install it with ‘apt-get install xfce4-mixer=VERSION’. There’s probably some apt pinning or holding trick you can do to avoid the problem, but I haven’t looked into it yet. Downgrade and put on hold works, Thanks! Using forks seems a good idea to me. Just to be as flexible (and Debian compatible) as possible doing such modifications. As a mantainer of a Raspbian based distro, this decision just added more work to me and complains from the users. This could be avoided if you just made a fork of the package, the way it should be done. Changing upstream Debian packages isnt the right way to do things. OK, we’ve learnt our lesson on this one – we’re going to move the modified xfce4-mixer to a dedicated package in the not-too-distant future. My assumption that Pi users weren’t using XFCE was incorrect – my mistake! Installed the new network interface but pressed “N” instead of “Y” during installation. How do I switch on the new version of the network configuration file? I have to say that the way the Raspberry Pi organization releases image updates is truly disturbing. While I appreciate that much effort goes into making these changes they appear to be dropped out in a manner that prevents any real beta testing or structured changeover. To simply change the one download available to everyone, with no pre-release and no way to get previous downloads makes it hard work for many. In my case as a book author, it makes it near impossible to be sure that you can help readers implementing a Raspberry Pi system build consistently based on your book text. I for one would like to see the organization take a much more professional and consistent approach to a release mechanism. A great statement if you have already downloaded a previous image revision, but for anyone buying a new ‘Pi there is only one choice….the current revision on the download page. And it is very difficult for any author to try and cope with. In this case the outcome is even more complicated, since anyone downloading NOOBS will get the previous revision (2-16) and the release notes are only current to the 2-16 version. Maybe I’m wrong and you have a location with all the revisions neatly available, but I have not found it on your site. The software does go through a beta program, but it’s to a limited number of people and private. Release notes are catching up as we speak. Limited staff sometimes means somethings are quicker than others, and is fairly common in this industry, documentation always lags behind. With regards one specific point you make, that of NOOBS, the new version is being prepared and will be available in the next few days; for various tedious operational reasons, the NOOBS image takes longer to prepare than the plain Raspbian image. On your wider point, that of releases, beta programmes and the like, we at Pi are in a difficult position, as we have two main audiences – educational and hobbyist (to put vastly overly-simplified tags on them…), and these groups have quite different requirements. Raspbian, particularly the desktop, is primarily intended to provide an easy-to-use computing platform for education (and anyone else who doesn’t want to have to worry about such things!) My remit within the Raspberry Pi organisation is to make the desktop as easy to use as possible, and that’s the focus of my changes – streamlining software, improving look-and-feel, simplifying complex operations. I will freely admit that the changes I have made will, in some cases, not be what the hobbyists and hackers want. If you are someone who is comfortable with hacking Linux to any extent, you’ve probably already customised your Pi the way you like it without any need of my efforts; if that’s you, please don’t download the raspberrypi-ui-mods or raspberrypi-net-mods packages, as they are solely there to achieve the aim of making the desktop nicer to use for non-hackers. At the end of the day, it’s an open source system, so anyone who wants to can customise it however they want if they take the time to learn how to do so. To be fair, the changes made in this release were pretty minor in terms of overall look-and-feel; this was not the wholesale redesign of the desktop that I carried out at Christmas, and if it’s any help, I don’t anticipate having to do that again – it will be small incremental changes like these from now on. The images that we provide will probably always be our most recent take on what we think provides the overall best experience for a Pi user. In an ideal world, we would be able to provide beta programmes, advance releases, pre-warnings of software to come, but we are constrained by people and time. We can look at making old images available for download (no promises at this stage…), but we wouldn’t be able to provide any support for them – again, we don’t have the manpower to maintain multiple sets of software. Pi is a very small organisation, and the software side of it is smaller still. But we are all professionals who take great pride in our work, and are trying to do the best we can to benefit as much of the community as possible. I do understand the pressures of working in both a time and resource limited organization. I have absolutely no doubt of your commitment to value and quality in the work you do. The poster after you provided a very valuable link to the historical downloads. Knowing now where things are archived is a great help, though I still find no documentation on this on the website. It would be very helpful to see a public heads up to coming revisions, and of course in depth release notes are so essential. Purely from a selfish point of view, changes in look and feel of the desktop, and alterations to desktop underlying functionality can be a pain. My author view (from my decidedly Windows background) is to try and have readers use the GUI as much as possible for project development. The Christmas release was a complete surprise and caused considerable re-work for me(again a selfish view). I know that you’re not there to make an author’s life easier, but both release cadence and functionality changes impact authors of books and I’m sure also impact educational materials and courseware being developed. Again, in my particular case where I want readers to be able to extend menu’s in particular, changes to the desktop (like using Openbox over LXDE) make a big difference. Jack, I do understand your frustration at things changing underneath you – if it’s any consolation, we have authors here at Pi Towers who have exactly the same problem with UI changes! And thank you for the links to your work – the 1-Wire article makes very good reading. With regards release cadence, we are going to try to move to little-and-often rather than these big-bang releases every six months or so, and again, it’s likely to be small changes and bug fixes from now on. I’ve got the core desktop working as I feel it should; for the rest of this year, I’d expect the majority of the UI changes to be adding new applications to the standard image rather than changing what is already there, which should make your life easier. Thanks Simon, the changes in the Christmas release changed the look and feel to that of Openbox; that and the unique directories for configuration was the main pain point. Now that link is very helpful, I can work with that. I have not been able to find previous revisions linked to from RaspberryPi.org. Re: old Raspbian images – will these be torrent links only? (I wouldn’t be surprised considering how demanding the community must be on currently offered OS images downloaded from servers). 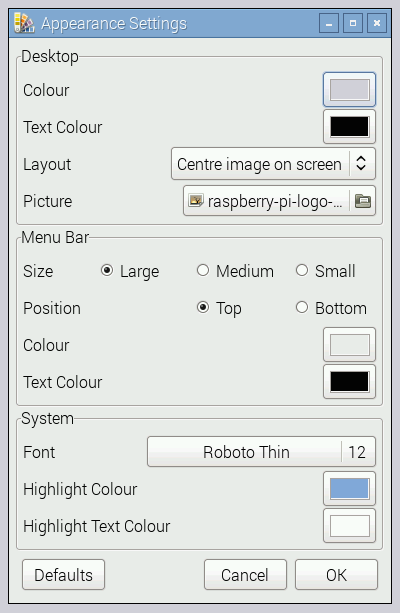 I would love to see two versions of Raspbian available:- a “stripped-down bare-bones” version aimed at the hobbyists for ultimate OS customisation; and the currently offered one (there have been many times when I’ve enjoyed learning new skills – Raspberry Pi does this *so* well…). Just done the dist upgrade but now wifi has stopped working. The dchp icon tells me dchp is not running. Tried rebooting but cannot get it or wifi, even with wpa_gui, to work. This is on a Pi2 which was working perfectly before I updated the distro. Help! Which wi-fi dongle are you using? Also, what happens if you manually start dhcpcd from a terminal window or the command prompt prior to “startx” by running “sudo dhcpcd”? I am just reinstalling Raspian from scratch and will try your suggestion once it’s ready. Thanks for replying so quickly. Do make sure you are spelling “dhcpcd” correctly – it’s very easy to mistype it, as I do so frequently myself! If it is really not found, then something has gone wrong with the install, as dhcpcd is one of the components installed by the new raspberrypi-net-mods package. Do also make sure you reboot after plugging in the dongle – the dongle must be present at boot time the first time it is used. If you are installing from the Raspbian image, once it is installed, try typing “sudo apt-get install raspberrypi-net-mods” from the command line after booting and see if that forces the software to install. I believe it might be dhcpcd5 in this case. Either dhcpcd or dhcpcd5 will work – dhcpcd is a symlink to /sbin/dhcpcd5. OK, I know that dongle works, as it’s one of those I tested. A very well thought out and implemented improvement which hopefully will provide a universal standard GUI for all those eager to lean the benefits of Open Source Systems. It’s easy enough from the Keyboard and Mouse settings – go into the main menu; choose Preferences->Keyboard and Mouse Settings. On the Mouse tab, tick the “Left handed” button. Three clicks in total! I changed Menu Bar to Small and Bottom, and System Font to 11 in Appearance Settings. It’s great that it easy to change this. I also added an extra desktop using obconf. I’m really pleased that someone is using the new Appearance Settings; after a lot of work modifying existing code, it’s the first application I’ve written from scratch for the Pi. Glad it’s useful! I’ve got a really old raspbian . But i do want to upgrade . Will i have to keep running the command ? until i get the new one ? This update caused extensive issues for me, including a flickering, non-functioning panel. I was able to fix it by copying the old config files back to the original location, but why change the file if it seemed to do nothing in the first place? Purging LXDE and reinstalling it didn’t help either. If the panel flickers and fails to load, it is usually a problem with a plugin. Go into ~/.config/lxpanel/LXDE-pi/panels/ and edit the file called panel with a text editor. Each plugin has its own section – remove each one in turn until you find which one it was that was causing the problem. I would suspect volumealsa is failing to start due to being unhappy with any external sound hardware you are using? If that’s the case, if you could please let me know what soundcard you have connected, I can investigate. I had no external audio device, only audio from HDMI. I do use an HDMI to DVI cable in case there is some issue with that. I understand no audio is supposed to come through, but I never mind no audio. ~/.config/lxpanel/LXDE-pi/panels/ and remove the volumealsa plugin and then rebooted. Problem sorted, but do not have any sound card connected, am using standard hdmi connection. Which Edimax dongle(s), there are many different ones. Care to expand on/post pointer to the “bug in its driver”. dhcpcd will not start automatically, complaining that one or more network devices are configured to use DHCP. If I start it manually in a terminal, it works. I had already configured /interfaces manually, changing the ‘manual’ entries to ‘DHCP’. Am I jumping the gun? Why does the new version of /interfaces configure wlan1 as well as wlan0? Indeed I have the exact same thing. dhcpcd throws the same boot error and theres an extra wlan1 that doesn’t have a physical device, in /etc/network/interfaces. This error starts right after rebooting a new install of the 3.18.14-v7 8188eu driver. Manual start of dhcpcd will pull an ip from the router, but the gateway settings are wrong so no actual routing can be done. Might be better in the forums! I’ve just spent the last 5 hours trying to get wifi working on a B rev 2 using the method described in your post. I have used 4 different dongles but still no success. When I’ve done this on a new pi2 but I also ran into problems but once I’ve done it, it works fine although I get quite a lot of extra txt on the loading and shutdown screen and seems to hang for a few secs. Is this normal? Is it better to use an older img if I want to use an original pi? I want to use my gertboard for something but the original C programs won’t work on a pi2, so I’m trying an older pi. The problem with dhcpcd not starting automatically appears to be common. As others (Nastanir, Milliways) noted, the boot screen showed “Not running dhcpcd because /etc/network/interfaces defines some interfaces that will use a DHCP client”. I commented two lines in /etc/network/interfaces that contained “dhcp” and rebooted, after which dhcpcd started automatically. I run rdesktop, I use all the screen but I’m not in fullscreen. I push the title bar of the window over the edge of the screen at the top and my rdesktop taskbar is at the bottom of the screen, (like all good taskbars should be). Now normally I just move the mouse to the bottom of the screen and the raspberrypi taskbar pops up and I can run programs from the menus, click on other programs on the taskbar to bring them into focus etc.. Except now, the raspberrypi taskbar pops up, but it is behind the window with focus, rather than on top of it as it always was. I know this because I have 2 pixels of spare space under my rdesktop window and I see the rpi taskbar rise up through this 2 pixel gap, I can click in the gap and bring the rpi taskbar to the foreground but tbh I would rather it behave how it did previously. After a bit of playing, it seems that whatever window has the focus, the taskbar rises behind them rather than on top of them. This makes the taskbar useless when you are using windows the size of your screen unless you resort to moving the window away from the place the taskbar is due to appear in. Is there somewhere to click that will set this right? Maybe a text file to edit or something. Hello, I’ve recently upgraded to this desktop but have found that Dillo isn’t in the internet folder of the start menu. Could you please include this for a new update please, as I use Dillo a lot and Epiphany is very slow on my Mark I pi. I have a problem with mine, on the old version i used scamp to play videos but it doesn’t work with the new version of raspbian, please fix this cause i cannot find a good A/V player other than that one. Thanks Simon the update worked fine, it has added a desktop volume control to my girlfriend’s pi, which is very helpful for her. I just did a distribution upgrade on a pi with many cron jobs but after the upgrade the lengthy crontab for pi was replaced with just a short default crontab. I had a backup crontab so I could restore /var/spool/cron/crontab/pi and no harm done. You may want to check that the upgrade does not interfere with any saved crontabs. How can I set up a wireless access point with the new network interface? I can’t edit /etc/network/interfaces, otherwise the new wifi system won’t work. This is an old post which is not being monitored – if you need support, visit the forums! I some how deleted the network gui from the desktop and don’t know how to open it up again. I am able to connect to the internet and open the wpa_gui but that does nothing. An I am trying to connect my wifi card I bought but wont connect given the directions given by adafruit. Best bet is to post a help question on the forum – lots of people there will be able to help.